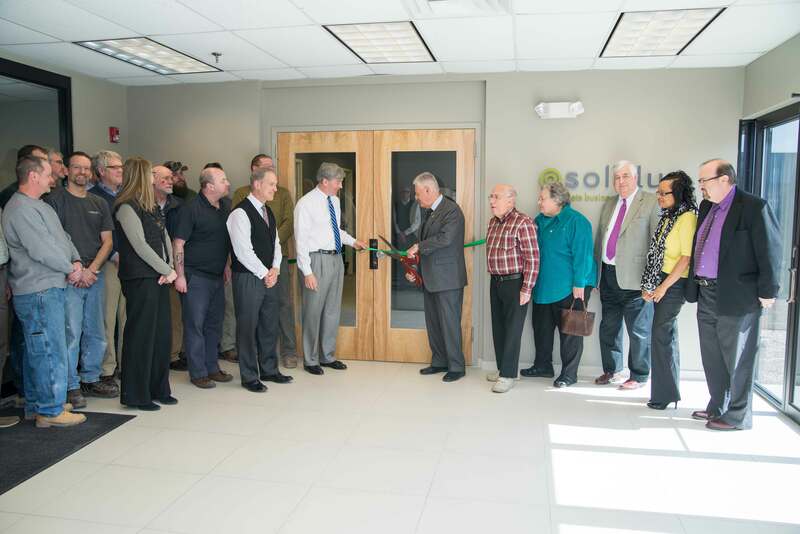 Solidus, Inc. companywide meeting attended by Bloomfield, CT Mayor for ribbon-cutting ceremony. Tuesday March 24th saw a companywide meeting at the upscale new office location of Solidus, a fast-growing company specializing in the design and construction of financial institution branches and company headquarters. The meeting was attended by all Solidus departments, and Bloomfield Mayor Sydney Schulman performed a ribbon-cutting ceremony at the sleek new space. Solidus moved from Rocky Hill, CT to the larger Bloomfield location due to space constraints; several new hires in the past year meant their old offices simply weren't big enough. The pivotal meeting was the latest in a series for the company, in which different department members give presentations to build greater awareness and appreciation for Solidus’s interdisciplinary approach. Their integrated project delivery method enables financial institutions and other retailers to enjoy a complete “design-build-furnish” experience, with all respective trades and skills being provided by the company. Solidus designs and builds banks and credit unions across New England, in locations as diverse as the Berkshires, Rhode Island, Boston and New Hampshire. They also design and build commercial space for physicians’ offices, educational facilities and custom retail outlets. Mayor Schulman cuts the ribbon, as Mark and John Charette and staff look on.Bloomfield Mayor Sydney Schulman at the Solidus, Inc. ribbon-cutting ceremony.